The new 2016 Report, published by United Nations University, is 39 pages. What is remarkable about it is not only that it arrives at almost exactly the same "ewaste" percentages as documented by academics (like Josh Lepawsky of Memorial University, who was savagely mud-slung by a certain NGO director in Seattle last month). 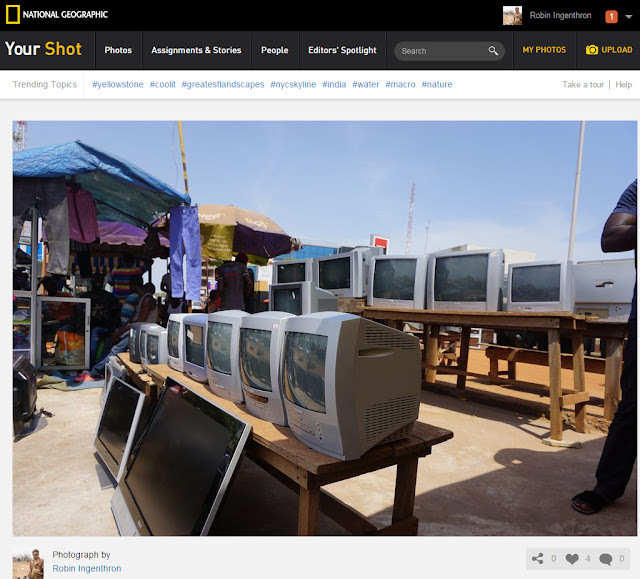 The #ewastehoax around places like Agbogbloshie has been roundly covered by several academics, Basel Secreteriat (the ACTUAL international organization, not the USA charity using its name), and data journalists. Again, disclaimer - poverty in Africa isn't fake. Toxics in Africa aren't fake. What was faked was the narrative that EU and USA recycling programs dump waste and are responsible for the poverty or toxics. What's remarkable about the UNU study is two things. First, it uses completely different data sets from MIT, Memorial U, US ITC, and data journalism by #ewasterepublic Jacopo Ottaviana, etc... but arrives at the same conclusions. 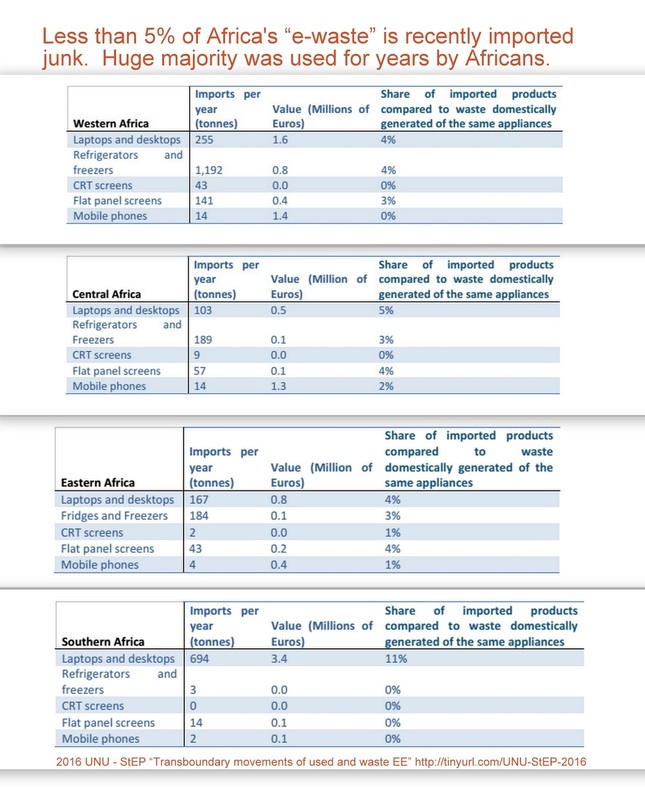 For example, the chart below shows that less than 1% of Europe's used electronics are exported intact . 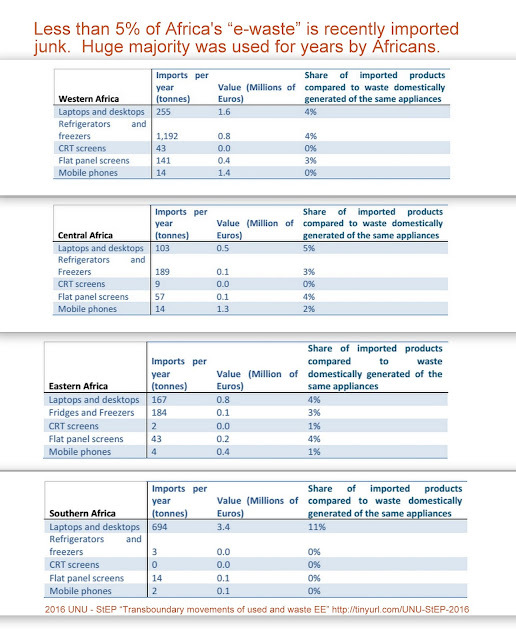 Very, very little of Europe's e-waste gets exported intact. In fact, I interpret the data to say that Europe is being waaay too conservative - the percentages of working and non-obsolete goods is way higher than what is being sent overseas. And very, very little of the junk in Africa's junkyards (like Agbogbloshie) came directly. More than 95% of Africa's "ewaste" is its own, devices imported decades ago, used productively for years. Some individual countries, they say, have higher or lower incidents of transboundary movement which is junk... but that begs the question... if it's an individual country like Burkina Faso, they are getting used electronics from wealthy cities like Accra. As Lepawsky and Mather already documented, there are used goods traded WITHIN the global "south". These screenshots shows exactly what I've been telling UNU and StEP since New Orleans in 2006. The "Stuff" in the "Story of Stuff" gets used for YEARS and is EVENTUALLY discarded and recycled. What's the first intact piece we photographed in Agbogbloshie? It was a scrapper's VCR device that Adam Minter and Isaaco Chiaf and Jacopo Ottaviana (#ewasterepublic) stooped to photograph. Africans imported millions and millions of used VHS players - IN THE 1980s and 1990s! In Joe Benson's itemized packing lists, there isn't a single VHS player. BECAUSE AFRICANS NOW WATCH DVD and STREAMING and soon, digital TV broadcasts. The latter will generate exactly what it did in the USA - waste analog CRTs. But those aren't being imported anymore to places like TEMA which have already switched to digital. Golly gee, Colonialists, the evidence is that Africa's Tech Sector knows it's STUFF. What Joseph Benson said on camera was the truth. What Mike Anane said on camera was a lie. Africa's Tech Sector needs reparations. Here's another gem from the UNU StEP report: The predictor of import is wealth. Africans who have electricity are considered more wealthy, and it's the wealthy areas of Africa that are importing that 1% of "Stuff". 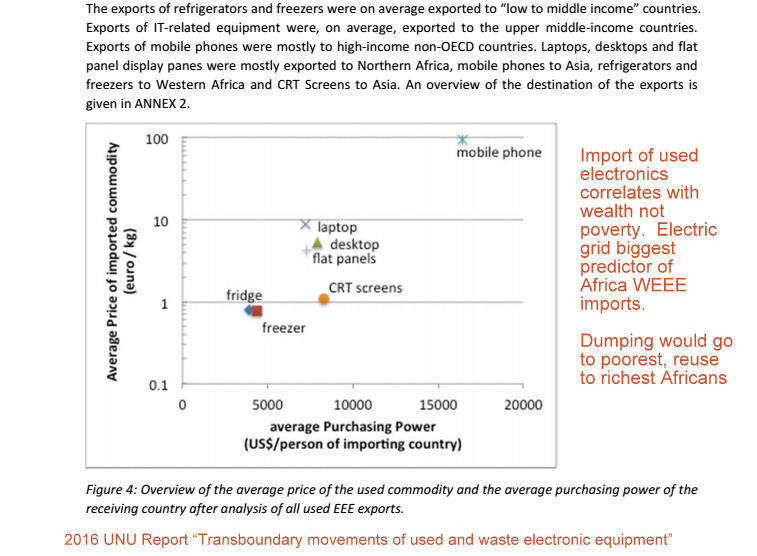 Among the people who do have electricity, the poorer half are looking to preserve food (fridges and freezers) and the wealthier are buying mobile phones... desktops and PCs are being imported to the middle market of wealthy, electrified, Africans. The second remarkable thing is that this study, like Interpol's and UNEPs, buries the lead. Rather than saying out loud "Gee, maybe Europe made a mistake by arresting and jailing exporters like African-born-techie Joe Benson, or Mark Daniels", rather than apologizing, the main "conclusion" seems to be "don't cancel our research, don't let this data threaten our jobs". The authors go to great pains to say that if the exports of used goods are improperly documented, it could be higher than ONE PERCENT. Gee!! But how much higher could it be, if it's not being seen in Africa's dumps until decades later? Sorry, guys. But you need to call this what it is. The NGO's raising money on the dumping story used pics of kids at dumps to create a myth, and kept ALL the donated money themselves. They not only didn't share any with the poster children victims, they stayed silent as Africa's Geeks of Color were jailed and thrown under the bus by reporters repeating their lies. If EU's policy wonks lose their WEEE funding, sorry. That's just not enough excuse to fan false, defamatory, racist, insulting, misleading headlines about 80% and 90% dumping. State what you found out. The E-Waste story repeatedly told by CBS, BBC, CNN, the Guardian, National Geographic, etc. s a !#@$ hoax. Photojournalists like Kevin McElvaney don't know any better, they actually think they were meeting a Mike Anane who remembers swimming in the Odaw River a decade ago... they didn't know "Sodom and Gomorrah" was a title invented by AMA Accra land developers in 2002 to justify seizure and mass evictions of the slum... the term was NOT about "recycling". I'm constantly asked to tiptoe around this Colonialist exploitation of African childrens photos, but once again, the story is about the MONEY. Reports like this are generating JOBS for EU policy makers. They are the direct beneficiaries, not Africans, of povertyporn. Remember what this blogger found out in 2015... that even in 2011, as Interpol's "Project Eden" was launching, and the UK Environmental Agency arrested and arraigned Joe Benson of BJ Electronics and Mark Daniels of Daniels Recycling, the House of Commons only assumed 19% was being dumped. Here again is a screenshot of the UK HOC Report on "Strategic Metals". 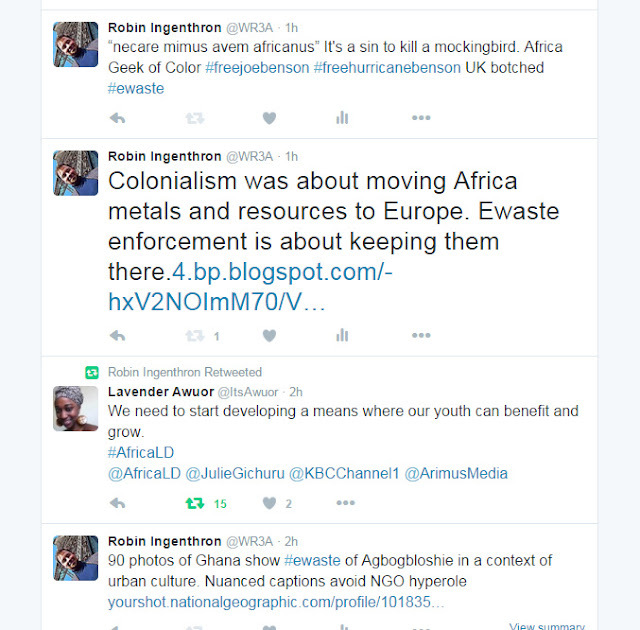 As my most pithy tweet of the past hour reported, "Colonialism was about moving Africa metals and resources to Europe. EWaste enforcement is about keeping them there"
The management of used (near EoL) EEE and e‐waste is one of the most challenging issues in the world. This is essential to maximize efficient resources use, but also to mitigate negative environmental consequences and potential negative health effects. 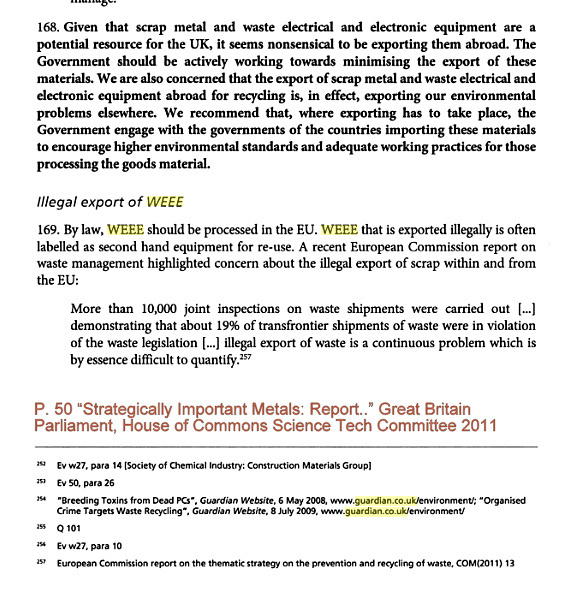 The quantities are moved across borders are increasing each year, and trading routes change over time due changes in the markets, imposed trading bans, changes in local e‐waste management laws and changes in enforcement. This makes monitoring these flows increasingly important. A harmonized method to monitor these flows that is robust, builds on existing statistical principals and that can be applied frequently is therefore essential. To date, there are no internationally agreed upon definitions on how to classify the movement of e‐waste and used EEE (near EoL EEE). 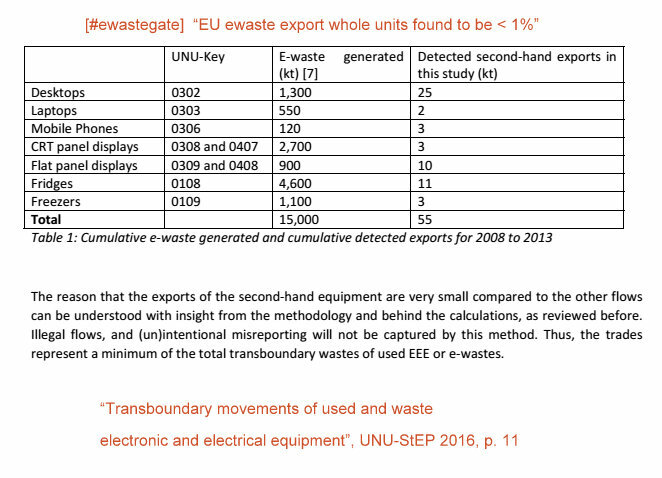 For instance, the definition of waste differs between environmental and customs legislation, which hampers the harmonized trade registers to be used for statistics on the transboundary movement of e‐waste and used electronics. 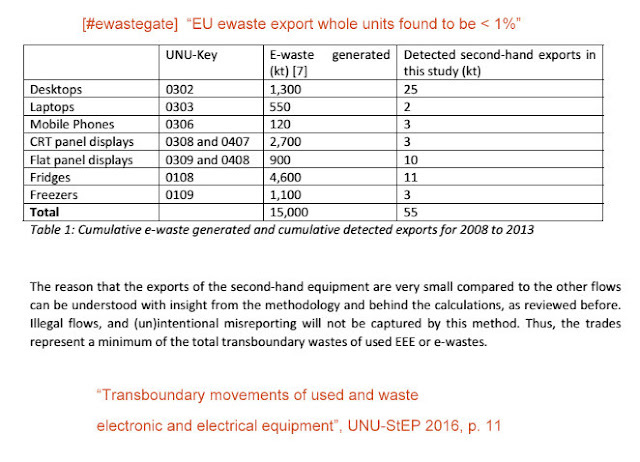 Alignment of the environmental definitions of e‐waste and of used electronics into the trade statistics would disclose much information that can be used to construct high quality statistics on the transboundary movement of e‐waste and second‐hand electronics. This data is essential for policymaking, which needs high quality statistics, and it would greatly facilitate the work on the ground for custom authorities and environmental inspection agencies in their efforts to verify the legal status of shipments. Therefore, at least one code for e‐waste, and one for used‐EEE needs to be created on world level.